To be honest, the experience of looking for the first time at those few surviving pictures from the 15th century, that were painted with glue on linen support is probably not one of ‘love at first sight’. Maybe because they miss the vivid and bright shiny colours of panel paintings. But doing research on these so called ‘Tüchlein’ there is more interesting stuff to be discovered than just muddy colours meeting the eye. For example scientific publications on the topic tend to vary in their definition of this more or less forgotten technique. So it might seem that there is a bit of confusion on which binding media were used by painters of the Northern Renaissance. 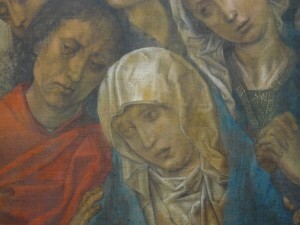 A nice challenge for further practical investigation on historical painting techniques I would say. 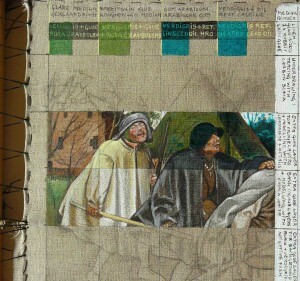 So In the last couple of weeks I have been bussy making reconstructions on linen canvas. 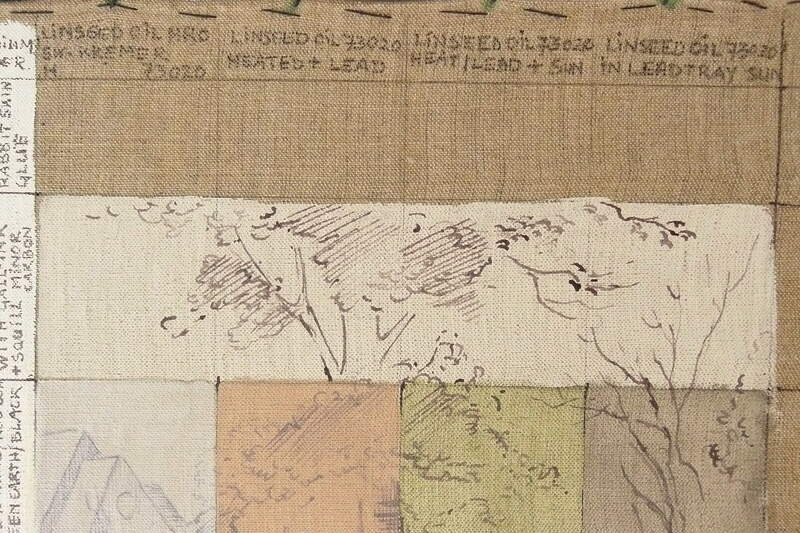 The straining method I used for the canvas dates back to at least 17th century but possibly even earlier. After applying different types of preparation grounds and impregnations and/or isolation layers to three distinct sections I was ready to start painting. But first I had to come up with a design. The easiest way would have been dividing each section into smaller squares and simply start filling them in with paint. Thus giving me the opportunity to methodical testing and observing the interaction between different undergrounds, binding media and pigments. At the foreground: three different sections divided in squares to mark distinct testing areas. But I also expected this to become a rather boring excercise. So a nice picture to reconstruct would be welcome. After a brief search on the internet on ‘Tüchlein’ almost ‘of course’ I came across Pieter Breugel the Elder and one of my favourites: his famous painting of ‘The Blind leading the Blind’ from the Museo di Capodimonte in Naples. 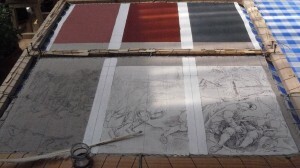 And so Breugel was to be reconstructed per square decimeter… so to speak. 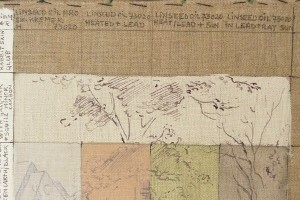 Each square has its own binding medium or distinct layer structure. It is said that this work was painted in ‘distemper’, but what exactly is this distemper-technique? Publications on the matter seem not to be exact or unanimous in their definition. I guess if one does not want to risk their neck, just play safe by only mentioning ‘animal glue’. But which animal and which type of glue? As my linen on the strainer was meant to become a testing canvas I decided that this would be one of the questions to focus on. So now there are distinct areas painted with glare, others with rabbit skin glue, some with gum arabic or with caseine. And some even with linseed oil that has been processed in different ways. 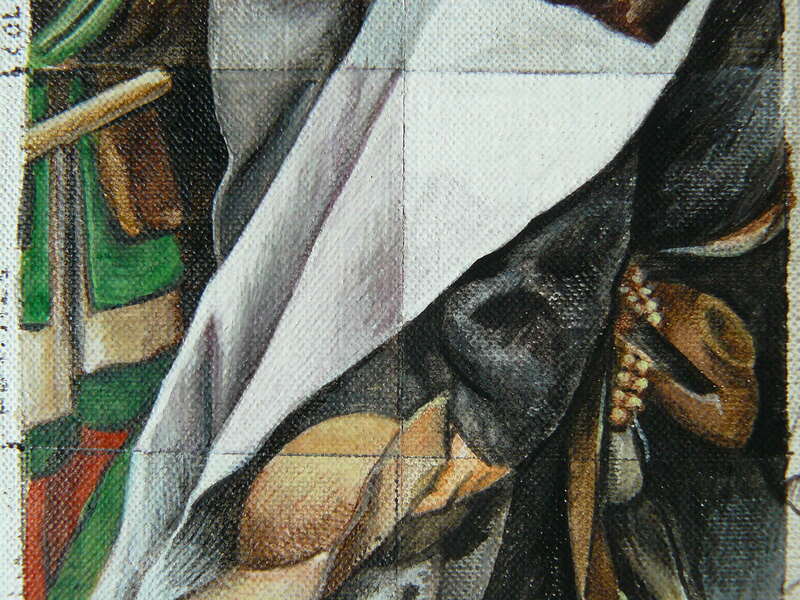 Layer structure showing the linen support, chalkground, underdrawing in gall-ink and different isolationlayers in oil. I know: gum arabic and linseed oil cannot be classified as ‘animal glue’. But the reason for also testing oil as a binding medium were some pictures I found of the backsides of two paintings on cloth by Pieter Bruegel, showing local discoloration of the woven support. Could this have been caused by certain binding media and/or specific pigments? Or could it only have been the result of later ‘varnishing campains’ ? Of course, then there were strict guild regulations for pigments and binders to be used for at least panel paintings in order to guarantee their long lasting quality. 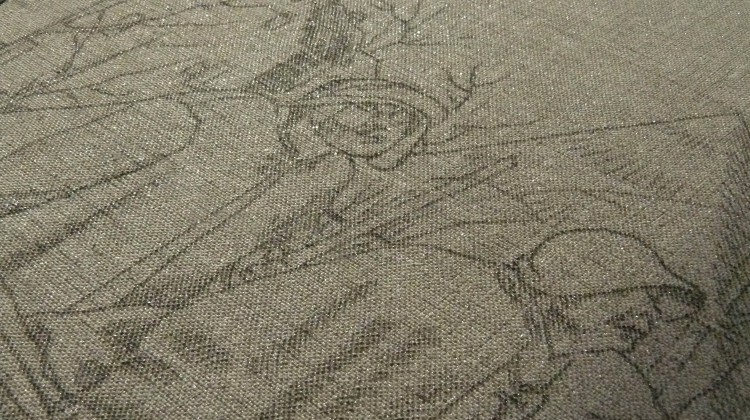 But what about the more ephemeral art of painting on cloth? Objects like banners, or temporary decoration for festivities from which only a small amount still exists. Were these also subjected to the same close guild investigations as panel paintings? And what about (court-) painters like Jean Malouel for instance? Might they perhaps have had a kind of dispensation for using or combining certain materials in order to make their products fitting the standard of their demanding patrons? Did some of the pigments change colour in their reaction to different binding media? However: eventually more and more Netherlandish artists started to paint with oilpaint on linen canvas. One can immagine that instead of a more or less sudden turning point, particularly taking place in Venice around 1500 and from there exported tot the rest of Europe, there might perhaps have been a more gradual and broader spread evolution from panelpainting towards oilpainting on linen canvas. Covering the glue-sized linen with a thin layer of chalkground thus would have been an in between step before painting on oilgrounds during the 17th century.